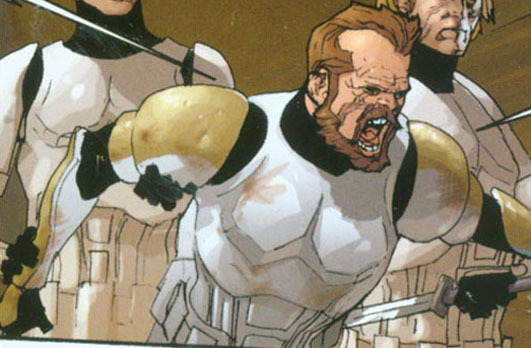 Harkas is a Stormtrooper commando from the Legacy era. As you can see, I gave Madine a haircut and and glued his head onto a Stormie body, and then added yellow stripes. I've also seen his stripes described as being green, but it looks pretty yellow to me. We have yet to see another Stormtrooper who wasn't in solid white, so I don't have any other examples to compare the color to.